Good morning polished world! How are you all doing today? It's the end of the month, therefore it's time for me to share my Monthly Mani Favs! I skipped out last month because I was really tired of Halloween manicures and wasn't in the mood to share them again. Can you believe though that it is the end of November? I feel like it just started. I am not going to lie though, I am excited for December and to start some Christmas nail art. There are so many cute ideas out there that I'm dying to try and make my own! Until then though, let's take a look at November's favs. 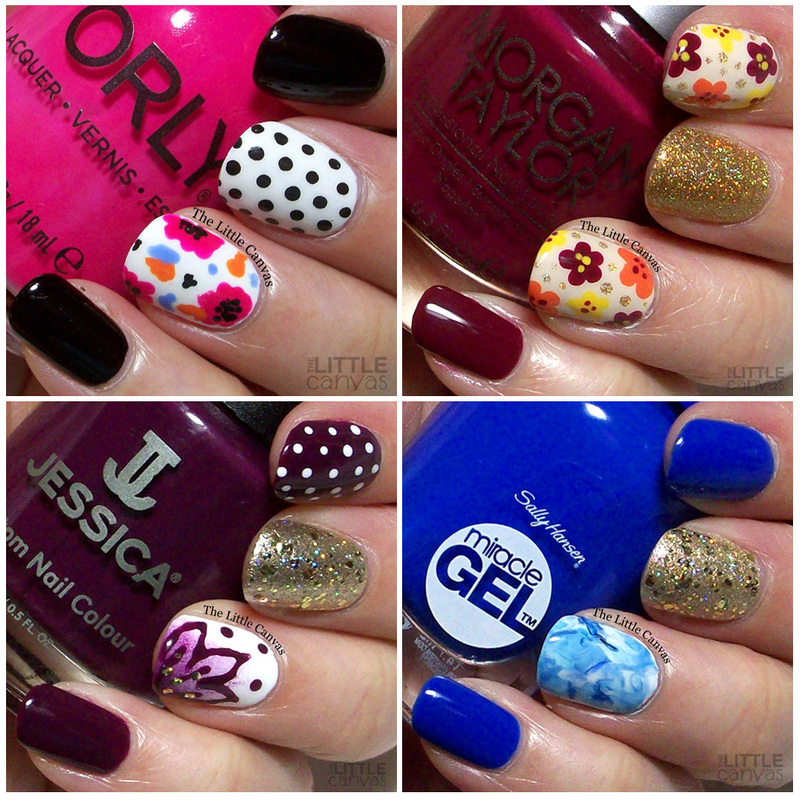 The One With the Abstract Looking Flowers - Loving this cute manicure using some of my favorite ORLY polishes. The manicure was inspired by Nicole over at Young, Wild, and Polished. I'm sad that Sally Beauty doesn't stock ORLY's limited edition collections anymore. Thank God for HB Beauty Bar! The One With Round 30 of Bestie Twin Nails With Fashion Footing - I feel like every monthly mani fav features my BTN with Amanda. I absolutely loved this Fall floral manicure using Morgan Taylor Looking for a Wingman. I love how the colors blended together and were perfectly accented with ORLY Bling. The One With the Splash Flower and Jessica Cosmetics - Mysterious Echoes by Jessica Cosmetics has quickly become one of my favorite Fall colors. This polish is from the Into the Wild collection. I just love how it looks sponged onto the white. The One With the Blue Smoosh Manicure - Love, love, love this manicure. This blue is one of my all time favorite colors!! The smoosh is one of my new favorite techniques also. Just look how neat it is! What's your favorite? Did you like some of my other manicures instead?